Passengers print the boarding pass as a normal document with their own printer at home, the office or anywhere with access to the internet. What does a Self Print Boarding Pass look like? Many airlines have similar styles. Here is an example from British Airways. The top part looks like a traditional pass plus a 2D bar code. The middle section has information about items not allowed on board. The final section has airport information. It is possible to print other information like lounge invitations, checked bagged information, destination information and so on. With airlines looking for as much ancillary revenue as possible it is increasingly likely that these passes will be used to sell extra services or will be full with advertising (like this one). How does Self Print Boarding Pass work? 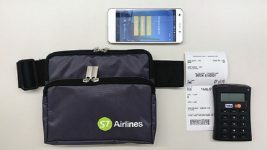 Passengers check-in online and then print the boarding pass as a normal document in either black and white or colour with their own printer at home, the office or anywhere with access to the internet. Some airlines give the option of getting the boarding pass by email so that it can printed at a later time. Passengers with bags to check go to the Bag Drop desk and show the Self Print boarding pass to the agent. The bags are tagged as normal. 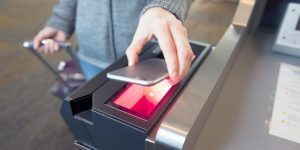 Currently there are 2 methods in use at security check points depending on whether the boarding pass has a 2D bar code and the equipment available at the airport. Passengers usually will hand the boarding pass to an agent. The agent generally scans the 2D barcode on the boarding pass. Why use Self Print Boarding Pass? Passengers with self print boarding passes can be refused at security if the BCBP cannot be read. This can easily happen with home printers. Because of this some carriers reissue an ATB type boarding pass at the airport. It is fairly simple to create a fake self print boarding pass. Duplicate passes can be printed anytime. In Singapore, due to security requirements, passengers have to get the self printed boarding pass endorsed at a desk.